Water to Wine, our little pet project from a few years ago was just featured in Make Magazine today! This article is the first in what will hopefully be a number of articles on how to make drink bots. Thanks Make magazine -- the article looks great! Yesterday, Lauren Blomberg and Brian Matis came over to drink wine and help me with a photo shoot for Make magazine. Brian had taken dozens of shots in August '11 of the broken down components and assembly procedure from start to finish. The shots were well lit and well composed. Fancy white photo umbrellas go a long way apparently, when it comes to taking good shots. The editor at Make recently started working on the article so it can go into their next issue, I believe volume 30. He found that he was missing some action shots though, with wine actually coming out of the machine. When we disassembled the machine for the August shoot, connectors, tubing and wires were cut and it sat that way for a while. Needing to take the action shots was good motivation to put it all back together. I used some new food grade tubing from the local beer brewing supply and put it all back together. We took dozens of shots in the kitchen while spilling water and wine now and again as we tried to work air out of the lines. After about half an hour of fussing, everything was primed and ready. That's when the silliness began. 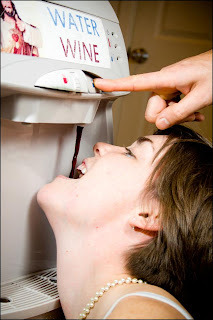 As we drank more and more wine, we began to become more intimate with the machine. Finally, Lauren thought it would be a good idea to put her mouth up directly to the outlet and consume that miraculous goodness. It was priceless.